A Perfect Landscape’s professional Denver, CO local landscaping services began in 1991 with brothers Marc and Scot LeDue, working long days and weekends doing residential landscaping design and home landscape building projects. They accomplished this all while working full-time jobs in commercial landscape maintenance. 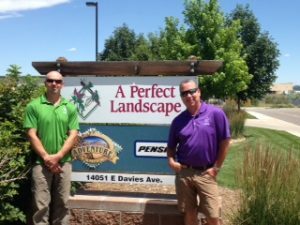 In 1993, they combined their efforts to create their own Denver certified landscaping company, A Perfect Landscape, Inc.
Due to Marc and Scot’s growing reputation for excellence as certified landscapers, A Perfect Landscape evolved to the point where it required commercial offices. This lead the landscaping business to Hinsdale, CO. During this time, Marc LeDue was running the business with Scot while attending classes for Certifications in Landscape Design and Horticulture. Today A Perfect Landscape, Inc. does over 1 million dollars a year in landscaping projects and employs between 19-24 experienced landscaping and sales staff. A Perfect Landscape relocated to its own office building in Centennial, CO in 2008, which is where it remains today. Their comprehensive landscaping services operate with 5-8 landscaping construction crews. A Perfect Landscape’s comprehensive year-long landscaping design and installation services target residential home landscaping design and backyard landscaping construction, as well as commercial landscaping design and construction. The landscaping teams keep busy during the warm months with the installation of perennials and groundcover, ponds, fountains, sprinkler system installation, patio installation, custom fire pits, outdoor fireplaces, retaining walls installation and design, pergolas, and more.. During the Denver winter months, they perform commercial and residential services, including hardscape installation, bulb planting, tree planting, and set-up for softscape installation. In fact, groundcover and other softscape elements can be installed all throughout the Denver year, due to the fluctuating and mild winter climate. They also offer holiday lighting services, including set-up and take-down. A Perfect Landscape’s dedicated landscaping contractors’ focus is on the client. They want their valued Denver clients to be 100% satisfied with the landscaping projects performed, no matter how big or small the project might be. When you hire A Perfect Landscape to perform a landscaping service you can be sure you are getting what you pay for. A Perfect Landscape stands behind their work, and will not be satisfied with your landscape until you are. Please call our office at (720) 851-3034 to schedule an appointment to discuss your Denver-area landscaping needs.